Please use the various search options on the left to view plants in different categories. This will generate lists from which you can click individual items in order to view the full details, including growing instructions and information about hardiness, flowering times, wildlife friendliness, toxicity, etc. When you have chosen the items you wish to buy and have clicked through to Checkout, you will be taken to Paypal when you click the 'Buy now' button. Please note that you do not need a Paypal account to make your purchase - you can pay by credit or debit card in the usual way. Paypal will guide you through the process and will send you an email when the transaction is complete. If you have any questions about this, or any other aspects of using the shop, please do contact us. Delivery will be by standard First Class post for next day delivery of orders weighing up to 1kg and by courier for heavier items (which usually take 2-3 days to arrive). 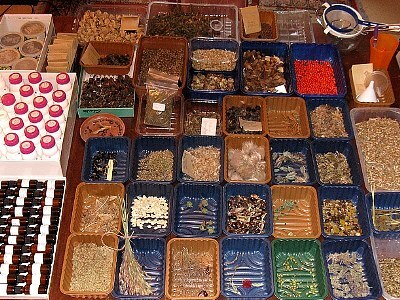 I usually post seed only orders within two days, and plants or mixed orders within 7 days. However, at very busy times there may be some delay - but I will email you to keep you fully informed. 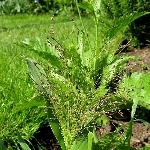 denotes that a plant is attractive to pollinating and other beneficial insects such as butterflies and bees, and/or provides food for birds and other wildlife. denotes that a plant may be toxic or otherwise harmful to humans and/or pets, birds and other wildlife. You can hover over the icon to view any details about toxicity. Please note, however, that the absence of this symbol does not mean that a plant is not harmful. Never handle or consume any plant that you are not absolutely certain is safe! This symbol indicates that plants (or parts of plants) are edible. Many plants have edible parts, of course - but some are quite surprising! 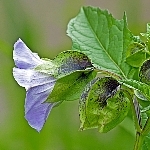 For instance, the flowers of all campanula varities are safe to eat, as are the roots and leaves of many of them; and nigella seed is frequently used in Indian cookery. But do remember the advice given above and eat only plants that you know are not going to harm you! Also to come in the near future: this symbol will accompany brief information about how some of the plants here are used in herbal medicine. Needless, to say, this does not generally mean that you should self-administer these plants, which can be very potent drugs - always seek the advice of a qualified practitioner! 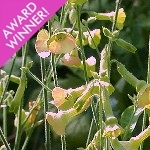 This denotes plants that have received awards such as the Royal Horticultural Society's Award of Garden Merit.